This is a question about the original Warfords. Can the gears/bearings be swapped between the cast iron and aluminum cases. The one with under drive, direct & overdrive. I understand the cast iron model may have a different overdrive ratio. From what I have found/read so far, the input shaft from the aluminum case would have to be kept as the one from the cast iron would be undersized fitting into the tail shaft of the transmission for a direct fit. I checked and it sure is. I am asking because to use the cast iron one have we would need the correct front U joint and the casting that mounts between the Warford and T transmission. We got the U joint but it's home made and very loose on the transmission input shaft. While I have not done a full clean yet the bearing and gears feel/look real good so far. When I looked at past post from the forum someone suggested that there was some information published in the Vintage Ford but did not follow up which one. Right now I am just trying to get some information to pass on to the owner so we can figure on how to proceed. Right now the choice are between the Warford and finding a large drum Ruckstell case to make one up out of the parts he has. This will be going into the non racing right hand speedster. Someone may correct me but it doesn't make any sense, a U-joint between the Warford and the T trans? although I have very little experience with Warfords and the differences in builds/models, the one I have the input shaft slides into the T trans drive shaft, no Uni. I run two original cast iron Warfords on my T s. One on the '25 C Cab and one in the '26 tudor. They both have that bolt-on casting that encloses an original Model T U joint that enters into the T transmission. And they both have the Warford frame bracket/brace. I like this double U joint setup because I feel it somewhat protects the crankshaft from breakage. Of course, both Warfords have a T U joint in the rear connecting the driveshaft. Frankly I've never been interested in obtaining an aluminum Warford. Warford from the drive shaft/torque tube, reattach, bolt up, and drive off. In my case the Warford is a under drive so I changed the diff to a 3/1. It makes a perfect 3 speed setup. And, it is quite. No howl. Love it. J. 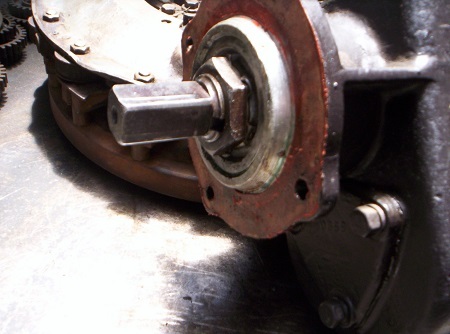 The cast iron model has a bolt on intermediate casting in front that has a bell that rest inside the 4th main, like the normal drive shaft housing, we are missing this part. It allows some flex between the transmission and engine even with the rear brace. The aluminum model bolts directly to the back of the engine without the extra U joint needed as far as I have been able to find out. If I could find an aluminum one with bad gears and could exchange the innards with the one I have on hand that would be great. Didn't somebody have just the aluminum case for sale on here not that long ago? Maybe I am missing some information; did or did not the aluminum model for the car use the casting between the transmission and engine with the u-joint? While these numbers are close they are approx. ; the input shaft for the CI model is about 1 inch square while the hole it would fit into if bolted directly on is about 1 1/8 inches square. Never seen the aluminum 6 speed with the front extension and U-joint. In fact, the square input shaft on the aluminum seems to be larger than that of the cast iron unit...at least it won't fit a U-joint. I found the back issue of the Vintage Ford with the Warford info , Vol 20 (1985) MARCH/APRIL PAGE 33. The info I gleaned from the story is; the aluminum 6 speed was used up to about 1926 when the cast iron case was introduced along with the power take off option. All the information shown there indicates the use of the extension between the transmission and Warford and U joint with just the 6 speed CI unit. The Illustrations do not show a way to mount a support cross bar for the earlier aluminum units or use of extension and U-joint at the front. So I would guess they bolted directly to the end of the engine from both what has been stated in the replies and illustrations. About the same time as the introduction of the cast iron 6 speed an aluminum cased 4 speed made available that was ether under drive or over drive depending on the customers needs. It bolted directly to the back of the motor. At some point could someone measure the size of input shaft on the aluminum 6 speed units. Mine looks to be an early aluminum one, patent applied for. "Just for anyone getting the mistaken idea, you cannot put one of these housings from an iron case Warford on an aluminum case without changing the input shaft too as the square on the input shaft is different size." I think this all puts me back to where I wanted to be without knowing it! If I can get the aluminum case version I can do as planed.